Rachel and Dustin were married in the Palm House at Franklin Park Conservatory one winter, and Rachel chose to wear her grandmother's vintage wedding gown. It was stunning and so different from modern dresses, both in the cut and style and in the fabric used. The drape was lovely and feminine. This photo was made after they had just walked back up the aisle and I had been photographing them as they were coming toward me. They headed up the steps and I brought the camera to my face and, before focusing completely, just took the shot. Taking the shot is always important, even if it sometimes doesn't focus, because you never know what you'll get. 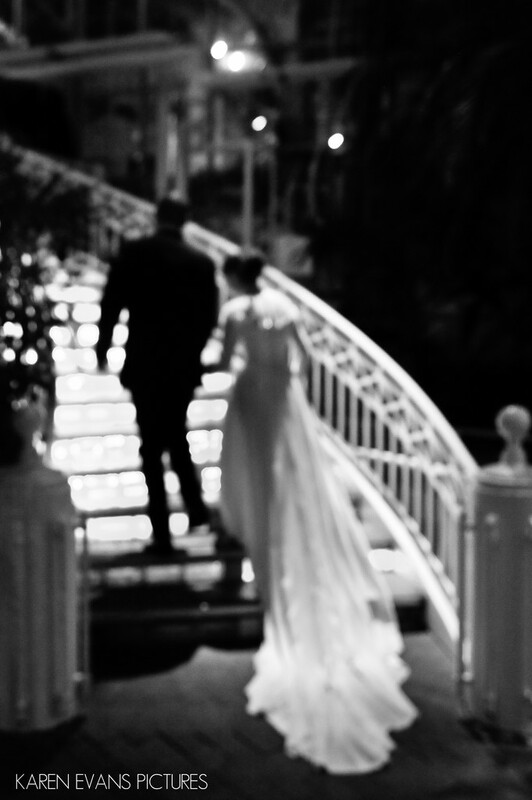 I love this photo for not being in focus because it feels soft and romantic, just like Rachel's grandmother's dress.Keywords: franklin park conservatory (33), winter wedding (78).